Look at these teeny, tiny, cute-as-heck cactii! 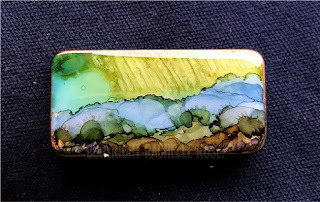 Here is a 1" x 2" Green Cactus in the Summer Rain tiny landscape, created on a durable magnet. It is resined with jewelry-grade resin and the sides are coated in copper paint. More of my tiny Rachro Flowscapes are available if you go to my Records by Rachro facebook page. They are each available for purchase (shipping available domestically within the US), and each domino has a super strong neodymium magnet, so it will definitely and reliably hold several things up on your refrigerator at once! Those little magnets are mighty and I wanted something strong, functional, and high quality to go with my tiny flowscapes.